← Chicken Soup or Exlax? 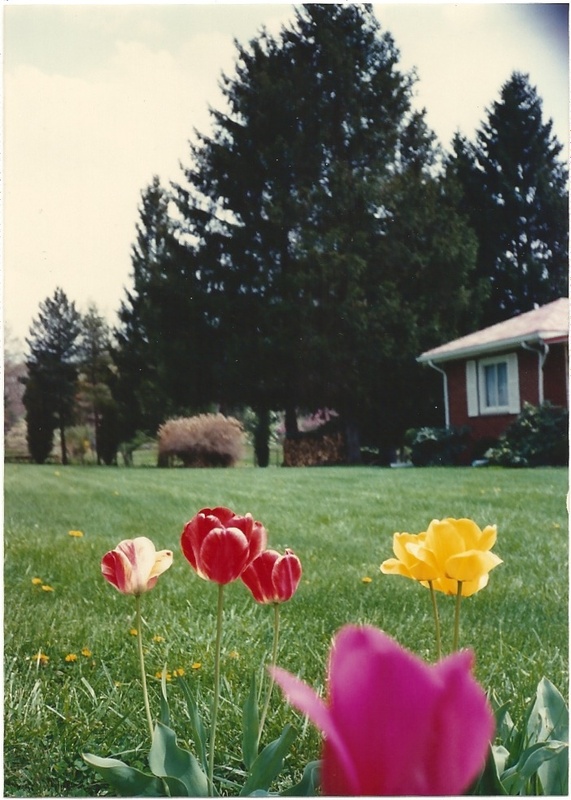 The front yard in spring with tulips and a few brave dandelions trying to hide from my mother. If you’re in a state that’s not Florida, California or Hawaii right now, you’re probably dreaming of spring. I live in California and I apologize up front. It just happened this way, I didn’t really plan it, so don’t hate me. I never gloat over the weather because I could be killed at any second by a terrifying mother of an earthquake. That pretty much evens things out I think. I’m a Pittsburgher at heart and always will be. Anyway, I hope spring comes soon for you, but if stinking Punxsutawney Phil is right, it won’t. So here’s a memory of spring from my childhood in New Brighton, PA, when spring meant fresh air, spring onions and asparagus, and frightening glimpses of my mother’s girdle. Springtime in western Pennsylvania is magical. Everywhere you look there’s an explosion of brilliant green grass. Tulips reach their tender arms up to the sky. I remember standing outside — cold, but warmed by the sun — and smelling fresh cut grass for the first time in months. It’s what I imagine coming back to life would feel like. As soon as the first blades of grass dared raise their heads, our neighbors were out in force. Mr. Pfleghar, dressed in his dark green work shirt and pants was in his front yard gleefully fertilizing the grass and poisoning the weeds. Mr. Smeltzer did the same. Mr. Schaeffer mowed his lawn, stopping to chat with anyone who’d listen. I rarely saw Mr. Goldbertson but always heard his chainsaw noisily chopping dead trees into firewood. Proof I’m not kidding. This was taken on my parents’ 50th wedding anniversary, she’s all dressed up but couldn’t help but pick mushrooms in the front yard before the family photo. 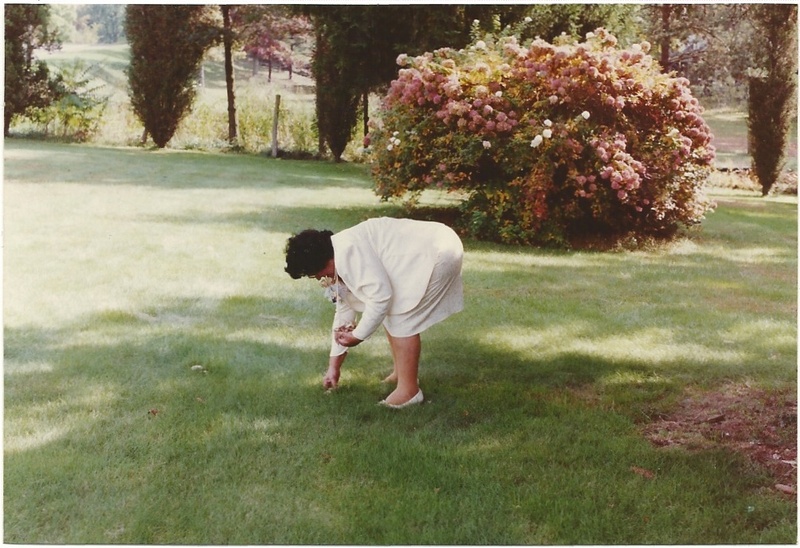 My Italian mother had her springtime ritual too. She bent over and picked dandelions in the front yard. Could you see the garters from her girdle desperately hanging on to those nylon stockings? Yes. Would she be out there for over an hour? Yes. Could the kids in the school bus see her when I was dropped off at home? I prayed to God, not. Was it humbling to realize, that my mother was, not only unfeminine, but was going to feed us what other people in the neighborhood were poisoning? You bet. Even though eating dandelion greens was an Italian custom, to me it was like putting a sign in front of our house that said, “Hey, we’re so poor we have to eat weeds!” I remember thinking, God, if we just had more money we could go to the grocery store and buy iceberg lettuce, like everyone else. Why do we have to supplement with stuff from the yard? Why can’t we eat tuna casserole, hamburgers and ham loaf like the Pfleghars across the street? Why can’t we have a weekly menu and eat the same things instead of waiting to see what’s in season? There I was, a child of the 60’s and my parents were hunter-gatherers. Other kids parents took them to the park to play, mine went to pick dandelions. Clearly, fitting in was going to take some work. My mom didn’t limit herself to dandelions; she also hunted mushrooms. She’d prowl the front yard searching for them, like a bloodhound on the trail. When she found one, she’d pull out her kitchen knife, slash the stem and pop the mushroom into her apron. She made her rounds, as natural as can be, as if everyone walked around with a kitchen knife and apron full of mushrooms. At least my father had the decency to forage for mushrooms in the fall, deep in the woods where no one could see him. Fifty years later, my mother is redeemed. Now dandelions are cool to eat. You regularly see dandelions, arugula, escarole, and flowers in your salad. What the neighbors were weed whacking, are now referred to as “field greens.” Vegetables I hid under my plate I now pay $15.00 to eat. I hope she’s happy. As for the hunter part, it was worse than the gathering. I’d walk into the garage, happy as can be and run head-on into a dead, gutted deer hanging upside down with his tongue hanging out. My dad and brothers would take pictures with the poor deer, as if they were prom dates. They’d return from hunting and my dad would tell me he had something for me, then reach in his pocket and pull out a dead squirrel, as if this would make my day. I’d pet their lifeless little bodies as they lay in the basement sink, waiting for my mother; the butcher. At one point or another, we also had rabbits, goats and a sheep (I think) all of which ended up as dinner guests, and not in a good way. #1. We really were kind of poor. #2. Europeans have figured out, you can’t count on politicians, governments, kings or queens, but one thing is certain; go hunting or plant a garden and you can be reasonably confident you’ll eat. #3. We loved to eat. So in spring, they dug and fertilized the garden with manure from a local farm. One of my dad’s farmer friends would dump a load of stinky manure right beside the garden and my parents were as thrilled as if they’d won the lottery. My dad spread it shovel by shovel, then planted. He’d work a full day as a brick mason, then come home, eat dinner with us, go out and work for two hours in the garden, tilling the ground with just a shovel before they got a rototiller. Then he’d break up the soil and create rows ready for seeds. My parents seed planting reflected their personalities – my father planted in neat rows, while my mother just threw seeds wherever she damn well pleased. 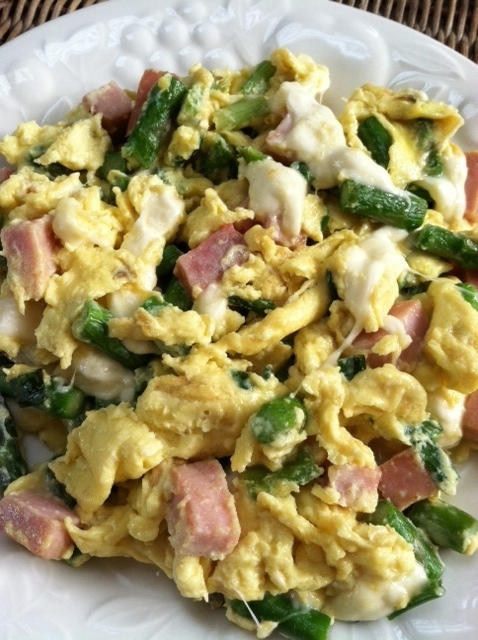 Asparagus, green onion, mozzarella and ham scramble, proof the universe loves us. Things grew either way and by April and May we ate fresh lettuce, onions, garlic, and my mother’s omelets filled with tender asparagus, sweet green onions, chunks of ham and creamy mozzarella. In mid-summer Mom wandered among the back yard fruit trees, munching as she went, while Dad dug in the garden. He’d work until dark; wiping the sweat dripping from the tip of his nose with an old red handkerchief in his pocket..
My parents spent late summer through fall canning tomatoes, peaches, pears, nectarines and plums, like a small scale Libby’s with children peelers as slave labor. They also made grape juice and wine. In July and August when normal children were swimming, and playing, we went blackberry picking in the woods in long sleeved shirts and pants. I can still hear the hiss of insects, the plink of blackberries falling into metal buckets, and feel thorns latching onto my skin and clothes. My blackberries never hit the pan because I was busy shoving them in my mouth. Afterward, Mom made blackberry pies and jam, and there was usually more food than our family of six finished in a year; a miracle only outdone by Jesus himself with loaves and fishes. It was a lot of work, which I didn’t appreciate as a kid, but I’m thankful for now because it kept us connected to each other as a family. It also connected us to life’s seasons and cycles, and anything that can do that, that doesn’t involve menstruation, is a good thing. Most important to my parents; it kept us fed. There must be something to it because eventually, even Mr. Pfleghar started a garden. I’m giving you two recipes here because they’re both scrumptious. 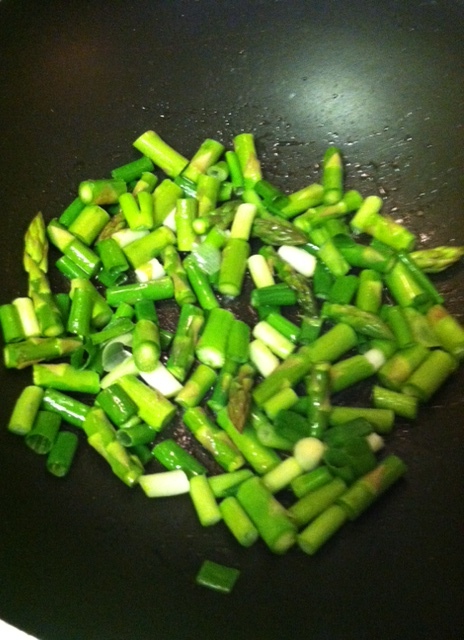 The first is sautéed asparagus with green onions. There is nothing better than the season’s first green onions. They’re tender and sweet. Same for asparagus, so they’re a natural together. The combination tastes like spring and is a great side dish for Easter dinner. The other is Mom’s amazing scramble with asparagus, green onions, chunks of ham, and fresh mozzarella. It’s also great without the ham. Asparagus has to be broken before you cook it so you don’t get the woody ends. To figure out how to break the stem, just hold a piece of asparagus in your hand and grab the cut end of it. Then gently pull up and it will naturally break where it’s supposed to. If you try to use the ends they’ll be too woody and won’t taste good. Pour the olive oil in a skillet or wok over high heat. Add the chopped asparagus and onion and keep turning it so it doesn’t burn. Cook for about five minutes or until asparagus is tender but not too soft. Sprinkle with salt and pepper and serve. Place eggs in a small bowl, add half and half, a sprinkle of seasoned salt and mix well. Pour olive oil into pan and heat it about a minute over high heat. Put in chopped asparagus and green onion. Cook until almost tender, then add ham until heated through, then lower heat to medium and add additional 1/2 TBSP of olive oil. Pour in eggs and stir about 30 seconds then add mozzarella. Continue cooking over medium heat until the eggs are cooked. Add salt and pepper to taste. Serve immediately. Serves two hungry people. This entry was posted in Easy Delicious Dinner Ideas, Great Breakfast, Great Memories and tagged asparagus, girdle, green onions, humor, hunter gatherer, Italian humor, mom, spring. Bookmark the permalink. I brought dandelions to my mom once………she said they werent flowers, they were weeds. The horror, the horror. But she put them in water anyway. Yeah, we moms are suckers for any flowers we can get from our kids. I guess you’re lucky she didn’t put them in your salad. Good point, mom used to make a salad, 7 days a week, 365 days a year. Lettuce farmers loved her. Thank God my dad grew our lettuce and we had a big yard. She would have been lost without it. Fran, I love this post! Reading it brought back wonderful memories of your parents. I laughed and cried as I read it. I can see your mother picking dandelions in the yard like it was only yesterday. The recipes had me mouth watering! I am so glad. I love writing them. It makes Mom come alive and I can just hear her, I’m thrilled it does the same for you. Love you, mean it! Fran, I love reading your blog. It always brings back warm, fuzzy memories. I can almost smell the great aromas from Aunt Mary’s cooking. Oh Colleen, I’m so glad. Thank you for taking the time to read them. Please feel free to send a link to your fellow food lovers. I have lots more stories to tell about her, the best ones are yet to come, although I do love Bernie’s ExLax story. Wait until I cover boyfriends! Hey, another Tunno family member contribution, good show! Yes, it’s funny “now,” but as a part of the family, knowing one of your sweet animals who you tried to keep as a pet back then, and having it end up as mom’s next day dinner wasn’t quite so funny at the time. ;-( From the animal lover of the group! Lord knows they meant well but agh!! Yeah, I know, I remember my favorite rabbits ending up on the plate and me refusing to get near it. But that was part of growing up. Thank God I never knew the deer. Fran, what a great post! As another east coast person now in California, you made me homesick for those Spring days, tulips and cut grass. Your writing is so vivid and wonderful! Btw, my father-in-law used to make dandelion wine and grew a huge garden that could have supplied a small village with greens! We must meet! I’m so glad. I know those first days of spring are just so wonderful, it almost makes winter bearable. Almost. Email me at: ftunnoblog@gmail.com and we will connect for at least a coffee! I loved your story about The Ramones…I think it was the Ramones…God, I hope it was the Ramones. Anyway, I love it. Any group that awakens your musical spirit is a great group. Again Donna, though I run the risk of redundancy, Love you, mean it!